It's no secret the lazy cat casting from the first Hunger Games movie PISSED US OFF. Seriously, how hard was it to cast a yellow cat? Well, all that is about to be changed thanks to author Suzanne Collins and new Catching Fire director Francis Lawrence. Because that cat has been RECAST! 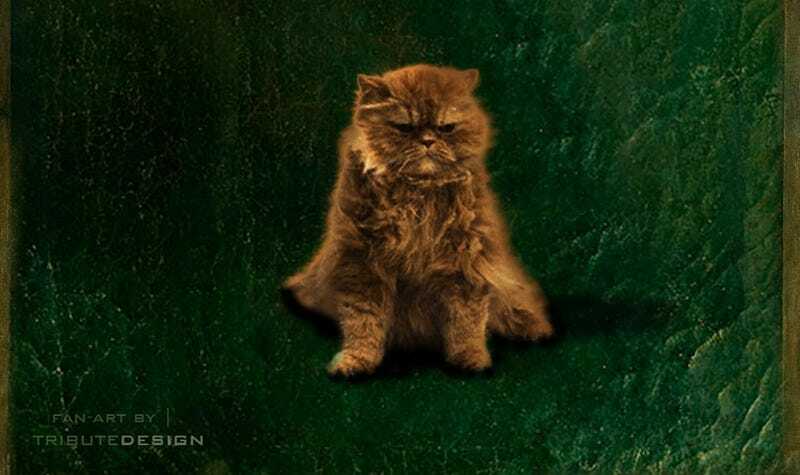 io9: One of the first big changes I noticed from Hunger Games to Catching Fire was that you recast the cat. Why did you recast the cat? It's funny because now people are split. Some people think we should have continued on with what happened in the first movie. And some people are really happy. You never win. Were there any other requests from the author? No, no, no. That was, quite honestly, the only simple thing, the Buttercup situation. Everything else was working on the story. We worked closely with Suzanne, which was partly why that came up. Thank god SOMEONE cares about Buttercup. But honestly, the "Buttercup Situation" is a perfect metaphor for Catching Fire and a lot of the fan nods and corrections this movie made specifically for fans of the book. You'll be seeing a lot more world-building this time around. Top image from Buttercup Enthusiast and fan artist TributeDesign.